So we just moved to Idaho Falls from central Florida...just in time for winter. I’ve never considered a fat bike and honestly never thought I would live somewhere like this. Until I accepted this relocation. So here we are. I want to ride in the woods come winter. Our local alpine club has a fat bike group. There are miles and miles of groomed winter trails in the area and many many more in and around Jackson/Sun Valley/Park City/MT etc. Not to mention all the ski resorts that have fat bike races. So...I know nothing about fat bikes. Been poking around some. I think I want to give fat bike racing a go. It’s really intrigued me. Also just getting out there in the winter on trails covered in snow...so peaceful. I’m thinking 27.5 x 4. The rig that’s caught my eye is the Salsa Beargrease. Anything else I should consider/know? Thinking rigid. This will only be a snow bike. I will only ride it in the winter. Like I said...this is uncharted territory for me. Looking forward to the collective schooling me. Thanks in advance! Fat bikes are awesome, no matter what you get you'l have a blast. I really like it because you can stay so much warmer on it that riding your mtb or cx bike on the road in the winter. Also we tend to ride with a big group of friends on the weekend and it makes it a hoot. I hear the bear grease is the go to for race bikes. BUT if I were you I'd get something that can do a 5" (4.8") tire. You want maximum float, you'll probably venture off the groomers and the extra volume and low pressure is definitely noticeable. I rode today at 3 psi with a 4.8" tire and needed everything it has. You don't need suspension on a winter only bike unless you ride in a lot of post holed/boot packed trails. For me that is maybe 1 week a year when the freeze/thaw cycles makes that a problem. Also flat pedals and winter boots, forget clipping in, in deep snow you will hate it. Thanks for the feedback man. Wow 3 psi? Holy cow. I can’t imagine riding at that low of a pressure. 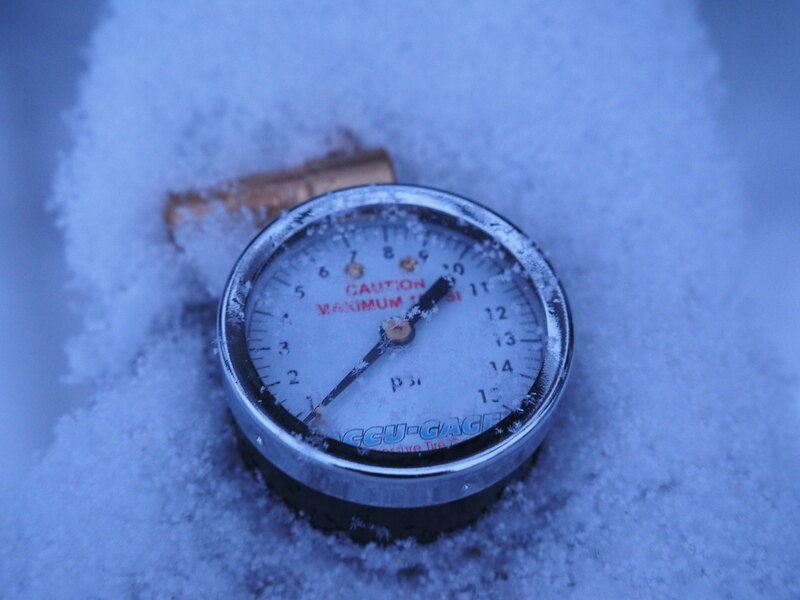 What kind of gauge are you using to get accurate measurements? Pedals...I’ve never ridden flats. Not sure how I would do with them. I was thinking Candy pedals like my CX bikes. I have some sidi winter boots. And wool socks. What about those hand warmer bags that attach to the bars? My hands are always cold. I appreciate the feedback. There’s only a few options here in town. One LBS is a salsa dealer. I think he rides a mukluk. I’ll definitely be picking his brain. Lots to learn. I got a Salsa Beargrease last year. It is stupid fun. Loving riding at night in the snowy woods. I usually pump up to 4.5 before I leave the house, then I can lower as I go. But with a ton of fresh now I just put 3 in and go. I use an Accugage 15 PSI gauge. I have Dogwood Designs Pogies. They are pretty amazing. I can wear a super lightweight liner glove on the up and switch to a fleece mitten for the decent even on the coldest days. Although sometimes I just wear heavy mittens. I always bring an extra layer and I like using a winter bike helmet. Mine is a ski/bike helmet from K2. It's super fun, no matter what bike you get you'll love it! Here to say that Moose Mitts / Pogies are a MUST purchase, I use Home I'm not a fan of the BarMitts brand. Don't be afraid of flat pedals you likely won't be getting rowdy... Note there's also a fairly robust resell market on Fatbikes. I can't speak to the Idaho part but Fat Biking is amazing. If you're predominantly looking for a snow bike, I think there's no reason to go "boutique;" I went with a stock Specialized Fat Boy and couldn't be happier. Yes, tire pressures are insanely low so you'll need an appropriate gauge. As for pedals, I think I rode mine exactly once with Crank pedals and promptly switched back to the flats that it came with. There can be a lot of stop and go, pushing etc in the snow and cleats becomes a PITA. I've since switched to flats on my regular mountain bike which I hardly ever ride anymore since I bought the fatty. You mention an Alpine Club. I'd hook up with them and test ride some bikes. Lumpy was kind enough to do that for me, although I think he also lured me into some sort of race I wasn't prepared for!, and I learned a lot. I had my mind set on a Surly based on all the marketing they do and, when I rode one my initial impression was "This is a heavy bike." YMMV of course but test ride if you can. Get mitts and good boots. I have a pair of Scarpa or Asolo winter hiking boots with a rubber toe cap that I wear. More comfortable than my winter road shoes and better suited for hiking if I have to. Gaiters, too. Dress as if you're going skiing! And don't forget you will probably need some sort of adapter if you have a bike carrier on your car. These guys know more than me so I'll just reiterate. Poagies=yes, I have cheapies from Amazon that still make riding so much better. For tire size I would ask the locals but I think that bigger is probably better. I've ridden in the winter for years, long before fat bikes and groomed trails. 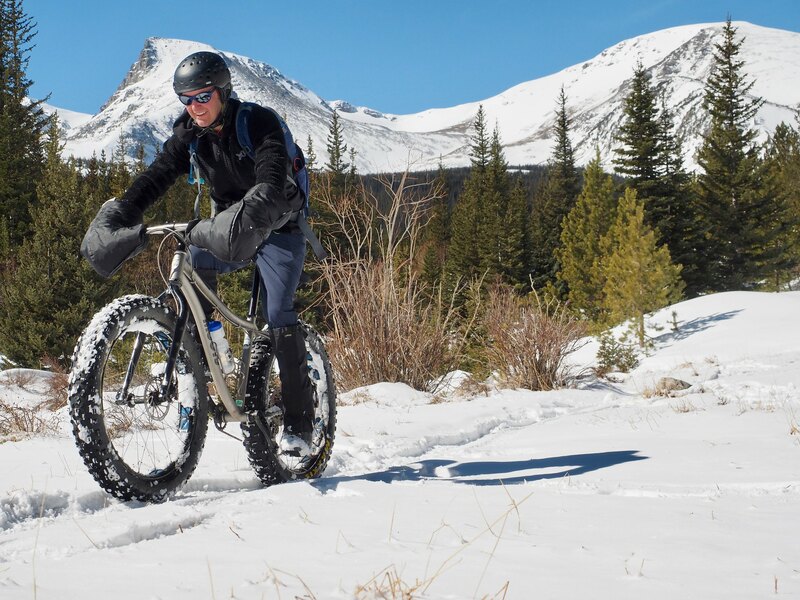 Fat bikes are FUN and make winter riding a joy and a nice addition to XC skiing. Borealis Crestone is a sweet rigid ride if you want to buy once and be done. This bike is light and not as harsh-riding as the Beargrease. If you're a bigger person that might not be an issue. My hands get cold really easy so poagies (hand covers) are a must in cold temps. They also allow you to wear a light inner layer for dexterity. Short rides you can get away with a water bottle but if you're out longer you'll want to use a hydration pack and insulted hose or keep a bottle in your back pocket close to your body. In super cold temps goggles can help protect more of your face. It's strange because I love riding and I love snow activities (ski, backcountry ski, snowshoeing) but riding such a bike in the snow is something that never interested me the slightest bit. If I lived where there was reliable snow for skiing or snowshoeing I'd be much less likely to ride in the winter. Here it's an option when there's too much crud to trail run or not enough base for skiing. It's a rare time when snowshoes can be used local. Another branch of the rabbit hole I fell into is fat biking at night. Endless lighting and clothing decisions. A fat bike ride crunching through snow on a calm starlit night away from civilization is amazing in sights, sounds, nocturnal animals, and peace...at least for this city boy. In super cold temps goggles can help protect more of your face. 4” vs 5” tires. I had a fat bike with 5” tires. It rode great. But two things made me move on. One was the fact most of the trails were groomed. And frankly, if it was sinking with 4” tires, 5” wouldn’t be that much better. And even if it were, it would not be fun slowly chugging along. I now have a 4” bike. Q factor. So wide on those 5” bikes. If wide Q factor bothers you, look at Rocky Mountain Suzi Q’s or Otso Voytek. Fat biking is fun. I love skiing, snowshoeing, snowmobiles, and other winter activities. But a good day riding crust on a fat bike. Hard to beat. Couple of us here have Trek Farleys with the 27.5 tires and they are good bikes. Pretty light frames and can fit a tire from 3.8" to just under 5" with the sliding dropouts. 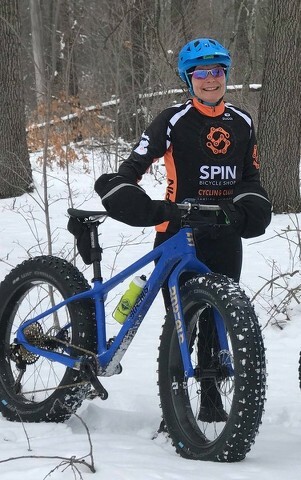 Another buddy has a Beargrease with 26ers and its is really light and he seems to enjoy it. Thanks for the all the input. Giving it a go tomorrow for the first time. Owner of my LBS is taking me out tomorrow. Looking forward to it! Perma-grin. Absolute blast! I went all in. Picked up a Salsa Beargrease. Still dialing it in. Installed some pogies and just got my 45NRTH Wolvhammers yesterday. Signed up for Jay P’s Fat Pursuit next weekend. Doing the 60k. In and around West Yellowstone ecosystem. Like I said...all in! Embracing Idaho and the intermountain west. Thanks! This is about to happen...about to mount up!